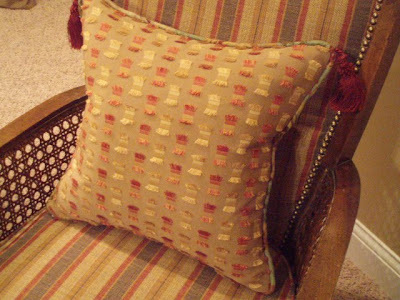 Make a Zippered, Corded Pillow Like a Pro! We're going to make one pillow with two different looks. I do this often for my clients because you can get two looks for the price of one. 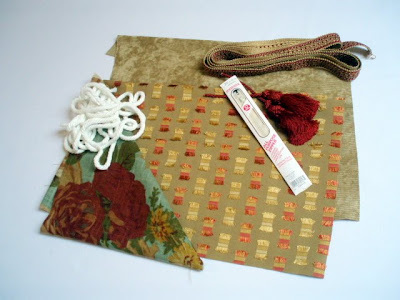 At the end of this post you'll know how to make fabric cording, insert a zipper, add tassels, apply a trim, and make a pillow. That word "zipper" sounds intimidating, huh?, Don't worry, I'm going to make it pain free for you. 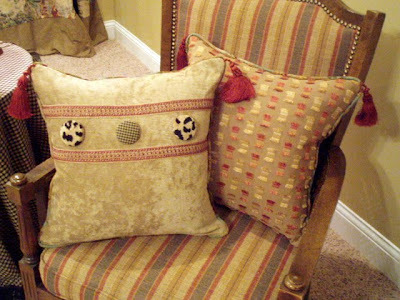 Decide on the size pillow you want to make. I've decided on 18" for this project, so I only needed 1/2 yard per fabric. I used 1 fabric for the front, 1 fabric for the back, 1 fabric for the cording, 2 tassels, a zipper, and 2 1/4 yards of cotton cord per pillow. 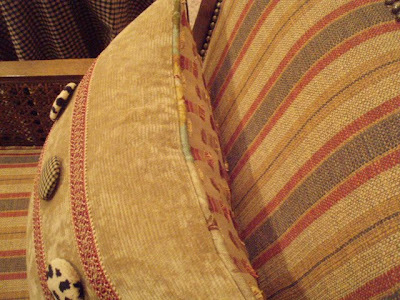 We're going to add trim to one side of the pillow, so before we sew anything together, let's get that out of the way. 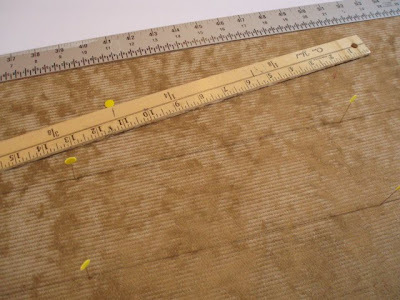 First, lay out your fabric against a straight edge. 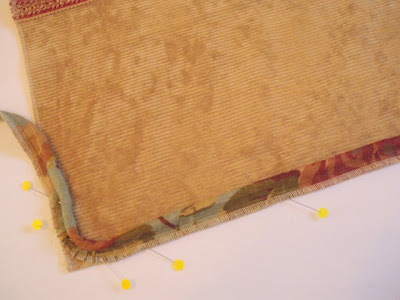 Mark the lines on your pillow where your trim will go, and then add a tiny bead of glue on that line. Note "tiny". 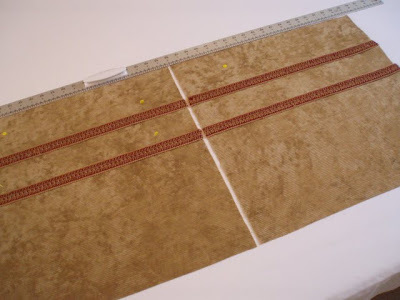 After the glue dries, sew the trim down on each edge. Ok, now set those aside and let's make some cording. 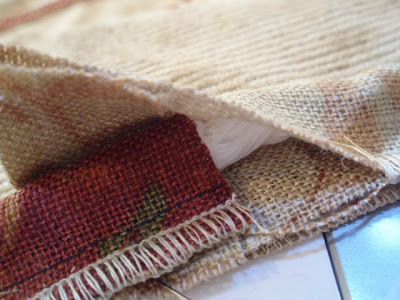 A little tip about making fabric cording - you do not have to be exact with your cuts because you can trim it in the end. For teaching purposes here, I did measure it though. Lay your fabric out face down. Take a straight edge and mark your first line. 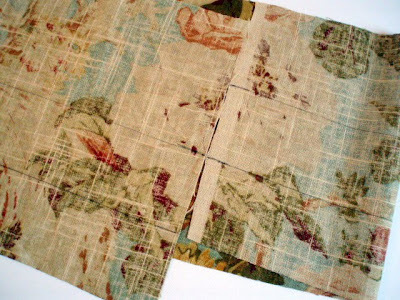 You'll want to have some degree of bias, but if your fabric is fairly flexible, a true bias is not necessary. In this picture, you'll see my bias is very leinient. My cord is 3/8" of an inch, and I'm cutting my fabric at 3". 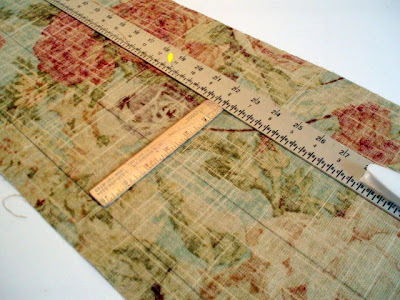 After you've marked your lines, you're going to stagger them and sew them together. The reason for staggering the lines is so that you can create one continous strip. This keeps you from having to sew several pieces together. 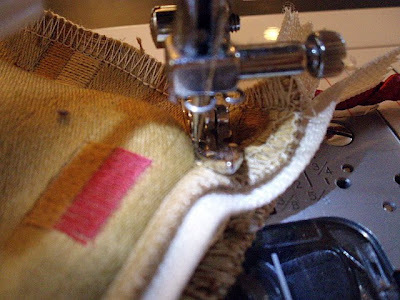 Once you've sewn your seam, press it out, and then cut along the lines. 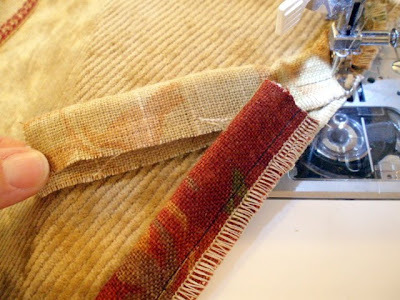 Now, put your regular sewing foot (not your cording foot) on your machine, set your stitch width at about 4-5, and sew the fabric around the cord. Do NOT try to sew it too tight against the cord. I'll explain why in a bit, but for now, just sew loosely. Notice my needle placement against the cord. 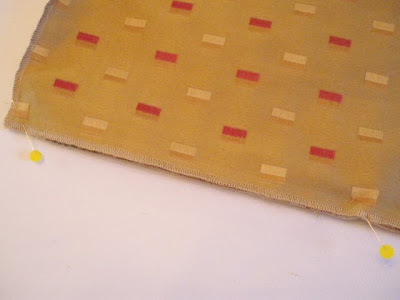 After you've done that, cut the excess fabric off about 1/4" from the stitch line. Leave a little empty cord. 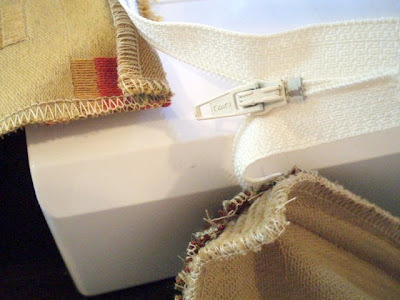 For those of you with a serger, just wrap the fabric around the cord and zip it through to trim off the excess. Now you're ready to begin sewing all of the parts together. Because this is a reversible pillow, you need to decide which side you'll be using the most, and we'll call that the front. First, let's sew the cord to the front. This is a good tip for beginners. 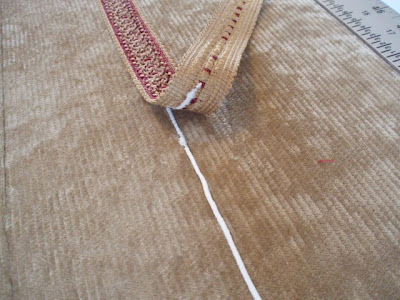 There is no need to pin the pillow together and try to sew the cord into the seam. The way I'm showing you will make sure that your cord is tight and professional looking. No need to pin your cord down too much. Every few inches will be fine. Be sure NOT to pull your cord too tight when sewing it on. When you sew it to the front side, I'm going to have you sew it at a stitch length of 5, and do NOT ride too close to the cord. You simply want to get the cord attached right now. We'll tighten it up once we put the layers together. 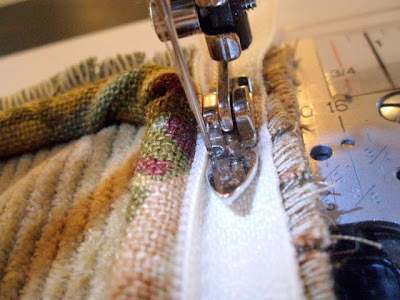 Doing it this way will keep you from having to try to cover your first stitch when you're finishing the pillow. Start in the center of the bottom, and leave about 2" of the cord unattached at the beginning. When you get to the corners, put a few little nicks in the cord with your scissors so that you can round the corners perfectly. 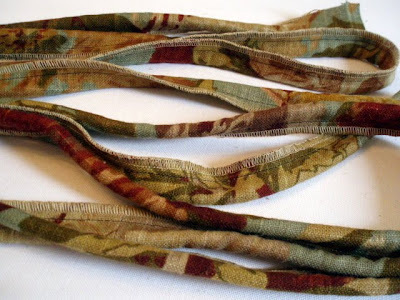 (A lot of people just put one snip in the corner and turn the fabric, but that creates puckering in the cord.) You'll be surprised how perfect your corner is going to look by doing it this way. Here's the easy way to join the cord at the end. It's easier to show you the pictures than to describe it, so if you look closely, you'll get it. Stop about an inch and a half short of where you began. Tuck the beginning of the cord into the end of the cord, and cut the white cord so that it joins the other. 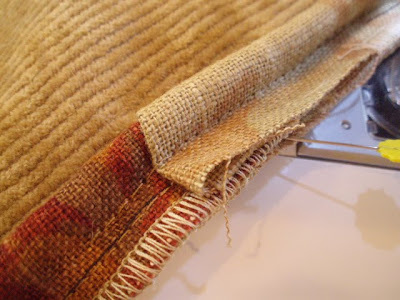 You'll need to take out a few stitches at the end so that you can wrap your fabric around the first part you sewed on. Hold it down really tight and then sew it all down until it's all attached. Now, remember that zipper I told you you were going to insert? It goes on this side. Because of that, you'll need to tighten the cord down on this side right now. Put your zipper foot on the machine now. You'll use it to finish the pillow out. 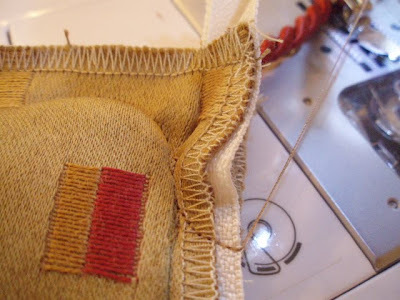 To get it tight, sew to the inside of the first stitch line on the cord. Get it as close to the foot as you can. Notice my needle placement. Ok ladies, pull out that zipper. Follow my pictures closely to see how to insert the zipper properly. 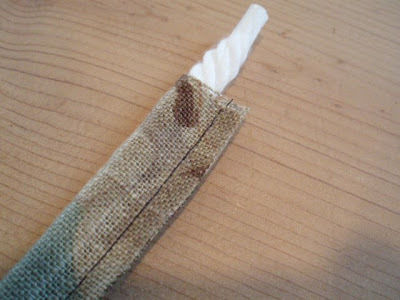 You'll sew it to the front side of your fabric first, right on top of the cord. 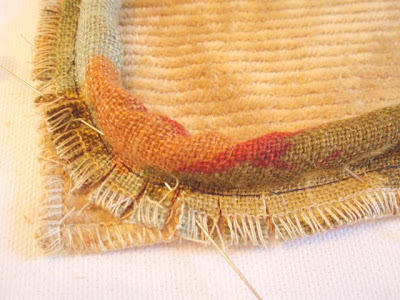 On the side you turned over, be sure to sew it about 1/8" from the edge. This will be the lip that overlaps your zipper to hide it. On the cording side, sew it about the same length from the edge. This will give you a tight fit on the closure. 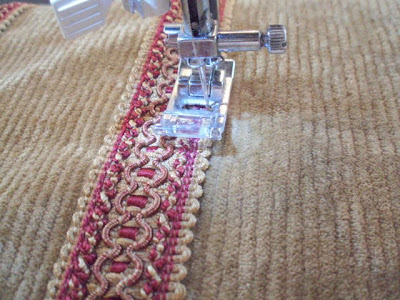 Sew both sides of the zipper down. Stop about 1 1/2" short of the ends. It's time to sew it together. Grab your tassels. 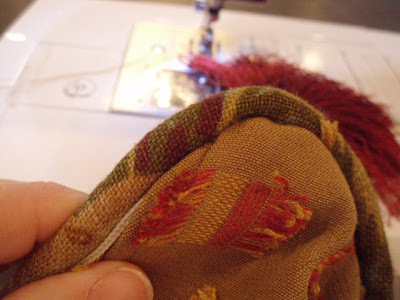 Before you sew the sides together, you need to sew the tassels down in the corners. Clip a couple of stitches where you sewed down the cord to the top corners. 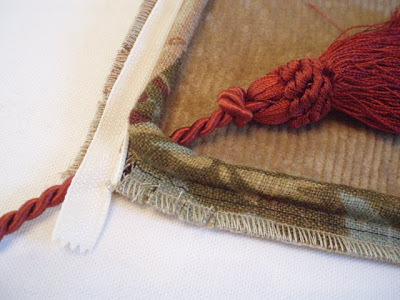 Push the tassel cord UNDER the fabric cord and sew over it. Don't sew over the zipper. 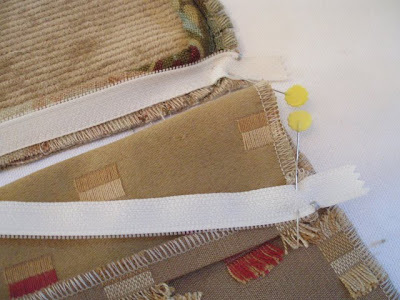 Now zip the zipper and flip the pillow so that you have the face of each fabric together. Pin the corners down, and put a pin the corners of the sides without the zipper. You'll sew the corners on the zipper side first. 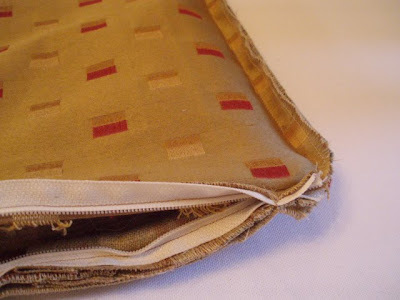 This will set your fabrics straight and give you a guide to go by when sewing the rest of the pillow together. Start sewing about 2" down from the edge that wraps around to the zipper side. Now, remember when I had you fold the edge of your back fabric over a half inch? You'll use that as your guide for your stitch line. Follow these couple of pictures closely. See where you turn the corner? As you turn it, you'll run right into the fold line. Stitch directly in that fold line. 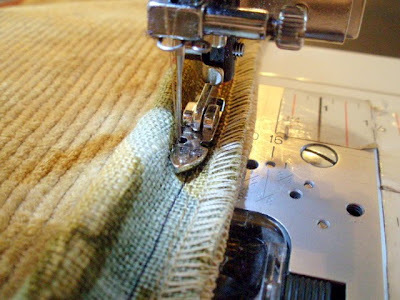 This will make your seam even with the zipper you sewed in. Then, be sure as you sew that the zipper is on the outside of your foot. You can tell by feel. This locks your zipper into place, Just wait till you see how perfect this will look on the finished side. When you sew the other end, do the same. You'll need to flip the pillow over and sew it from the other side. As long as you're sewing in that crease line, your zipper will be perfect. Let's flip that corner right now and take a peek. Notice how the zipper just goes away in to the corner? Notice how smooth that cord is on the turn? These are little tricks you learn with experience, so I just put you ahead of the beginner's game. Ok, flip it back over and finish sewing the pillow together. IMPORTANT: UNZIP your pillow right now. You've got the corners sewn down on that side, so now it's safe to open it. 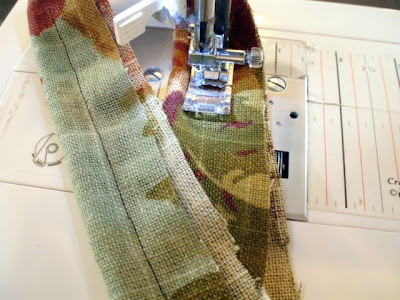 Alright, remember a few steps back when you were sewing on the cording loosely? Here's where you'll tighten it up, and where you'll thank me for not having you sew it tight the first go around. Start sewing where you left off sewing the zipper on. Try to get the needle as close as you can to the cord. Do NOT pull your fabric too tight. Your machine has feed dogs on it for a reason. It pulls the fabric through at the rate the machine was designed to pull it. If you tug at it too much, you'll bend your needle. This is the exciting part. Turn your pillow right side out and see what you've created! Pop a pillow insert in it and put it somewhere that you can see it everyday. Congratulate yourself. I bet it's beautiful! I added a few fabric covered buttons to mine to jazz them up a bit. Now you've had your fisrt VERY THOROUGH sewing lesson with Polly. I hope I've taught you something you can put to use right away. Please help me out so that I can plan future sewing instruction post by letting me know what you think. Is this too much information in one post? Do you like being able to read/print out the full instruction all at once? Would you prefer to have each session broken down into parts? Let me know and I'll tailor future posts accordingly. I don't want to scare you away with such thorough instructions, but I also don't want to leave you feeling like you have to wait to finish a project. I'll let the readers decide. Several weeks back I posted this as a guest post on another blog. I want to share with you an email I received afterwards. This goes to show that, YES, you can do it even if you're a beginner. This reader took the elements of what I taught in this tutorial and took it to the extreme for her very first real project. POLLY!!! You won't believe what I did? I mean, you don't even know me. But let me tell you, I'm so excited. 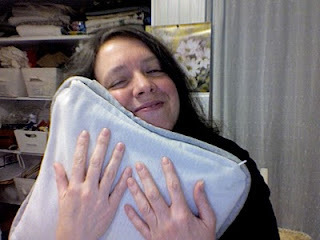 I saw your pillow thingy on Donna's site. I got so inspired. I am Miss Enthusiasm when there's something to be enthusiastic about, of course. I was going to make a pillow, with cord. I've made pillows before. Just your basic kinda pillow - complete with hot glue to close the sweety up. Nothing too fancy. I'm not a seamstress. I'm the "owner of a sewing machine". Not a sewer. So. What did I do with all my enthusiasm and sewing knowledge? I made a slip cover!!! What?????!!!!!!!!!! I did! I did! I can't believe it. I can't believe my hands and heart sewed this wonderful pretty!!! And today, Lord willing, I am sewing a cover for the sweet otto(woman) that came with her. A find from CL! And then a pillow cover for a smallish pillow (WITH A CORD!!!!!!!!!!) to sit on my newly slipcovered chair!!!! I had a meeting to go to last night. When I got home, I went into my studio to stand and stare at my slipcovered chair. Then my husband told me that he loved it so much while I was at my meeting he went downstairs for something and found himself looking at the chair and feeling so proud of me! I know this was a long story. But if you knew how many piles of fabric and inserts and cords and well, no zippers, but stuff I have waiting to be made, sewn, created. You'd shout something or scratch your head. What was I waiting for? The teacher!!! Thank you! Bottom of my heart thanks! I cannot wait to learn more! Btw, I have a tiny blog and I know how long and arduous these posts can be. I truly appreciate you setting all these photos and instructions and taking the time for the "sewer wannabes" out here!! Have a look at how she transferred what she learned to her own project. 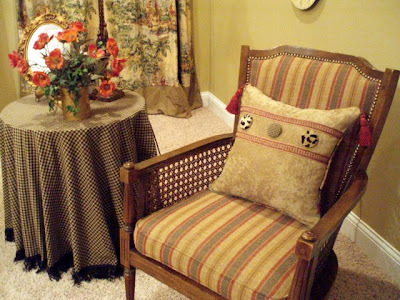 Pop on over to Kolein's blog to see the slipcover she created! And read through it while you're there -she's a funny gal that'll keep your in stitches (no pun intended). Hi Polly, This is an amazing tutorial. I love it that you have done it all in one post. Funny but I was making pillows today too. Great minds. I went fabric shopping yesterday and will be making a little dress soon. Thanks for the lesson. I would love to have you drop by and enter my GiveAway. Kolein is a hoot! And you are a generous soul to share this lesson! 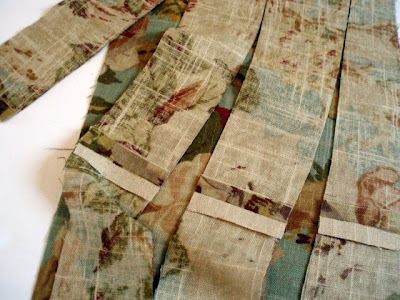 I hope to try this after we get settled in our new cottage and I can start sewing/crafting again! Thank you so much, sweetie. Thank you for sharing those tips. I am a very very new sewer and have jumped right in. 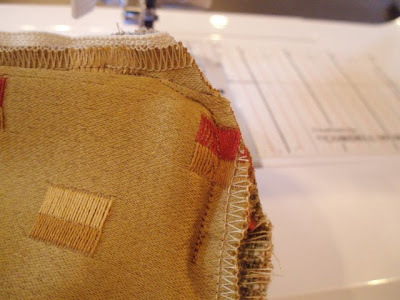 I liked the cording tips especially as I did sew real close on my first go. I'll keep your page an reference when I tackle zippered pillows. Are sergers really as scary as they look? I inherited my mom's and I don't know what to do with the darn thing. Wonderful tutorial!! Just the right information!! I think I can do it now! I hope you're feeling better and the headache has subsided. I know the hangover effect you can sometimes get after a bad migraine so I hope you're getting plenty of rest. Your tutorial was the best I have ever seen. I haven't done any real sewing in quite a while (and I was never good at zippers) so I loved your step by step instructions...they were perfect! Thanks for taking the time to write and photograph this post, I know it had to take a lot of time. Be still my heart! Who's the "crazy lady"? Hmm? This tutorial is simply the best. Seriously if I can do ANY of this kind of sewing, it's the BEST! And just so you know....I CANNOT SEW A STRAIGHT LINE and still managed to do piping and a zipper! Love you Polly! I'm bookmarking this one to refer to when I put a zipper in my slipcover!!!! Ouch!! Did I just type that??????!!!!!!!!! But above all, I am SO glad you are feeling better! WOW! You are so talented. I really liked this tutorial (I love pillows). I think you explained everything very well. I also love the letter and picture at the end. Adorable! Great tutorial! I have been wondering how to add cording to my pillows (I'm a novice), and you have explained it perfectly! I can't wait to go try it! 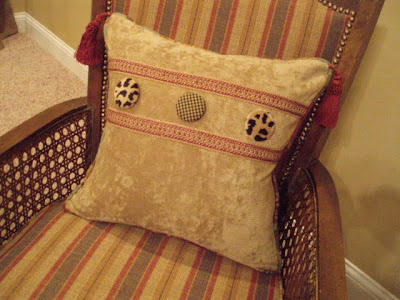 Thanks for this great post explaining how to make a zippered, corded pillow. You provided great instructions and illustrations.